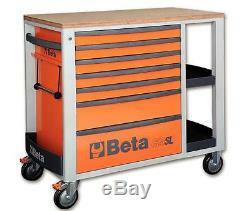 Beta Tools C24SL/R Mobile Roller Cabinet Tool Box Work Station Roll Cab Red Roll. Main features: Seven drawers (588x367 mm) with ball bearing slides: 5 drawers, 70 mm high 1 drawer, 140 mm high 1 drawer, 210 mm high. Drawer bases protected by foamed rubber mats. Four castors 125 mm in Ø: 2 fixed and 2 steering (two with brakes). Static load capacity: 800 kg. Multi-ply wood worktop with holes for a vice (1599 M100, to be ordered separately). Side compartment with vertically adjustable top. Please note: Our Product images and descriptions are kept as accurate as possible, but due to the vast range and complexity of products we sell, there may be some variation, eg exact colour, finish, packaging etc. Motorsport-Tools UK Llithfaen Pwllheli Gwynedd N Wales (UK) LL53 6NH. 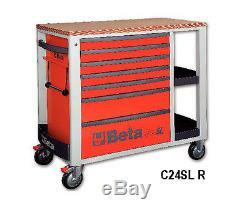 The item "Beta Tools C24SL/R Mobile Roller Cabinet Tool Box Work Station Roll Cab Red Roll" is in sale since Saturday, March 25, 2017. This item is in the category "Vehicle Parts & Accessories\Garage Equipment & Tools\Tool Boxes & Storage\Other Tool Boxes & Storage". The seller is "motorsport-toolsuk" and is located in Pwllheli.